Buy Suma Select Apricots 250g in the UK from our online shop or directly from our independent Scottish store. A source of beta carotene and minerals. Used extensively in savoury and sweet dishes. These rocky roads are a vegan version of the classic rocky roads which normally contain butter and milk chocolate. By using coconut oil and vegan milk chocolate you can still have a tasty vegan rocky roads treat! This recipe contains 100g Dried apricots, chopped. Where can you buy real Apricots 250g safely online? If you are wondering where you can buy Suma Select Apricots 250g safely online in the UK, then shop with us. 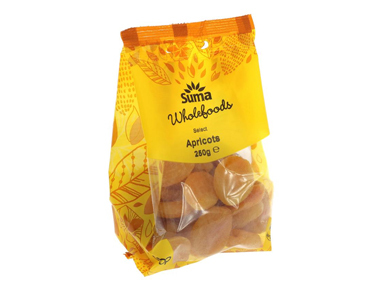 Apricots 250g - Suma Select Apricots 250g in Dried Fruits and Foods.